Today in Masonic History Richard Edward "Eddy" Arnold is born in 1918. Richard Edward "Eddy" Arnold was an American country singer. Arnold was born on a farm near Henderson, Tennessee. Arnold attended Pinson High School in Pinson, Tennessee. There he would play guitar for school events. He would not graduate, leaving school to work on the family farm. He would continue to play school functions though often arriving on a mule with a guitar strung across his back. In 1934, Arnold debuted on WTJS-AM radio in Jackson, Tennessee, officially obtaining a job there in 1937. Over the next several years he would play at a variety of radio stations from Tennessee to Missouri and Kansas. In 1943, Arnold would perform on the Grand Ole Opry. The following year signing a record deal with RCA Victor and manager Colonel Tom Parker who would later go on to manage Elvis Presley. Arnold's first single was little noticed. His second would go to No. 5 on the country music charts. That would be a decade unprecedented chart performance for Arnold. He would have 57 hits throughout the next decade with several number one hits. 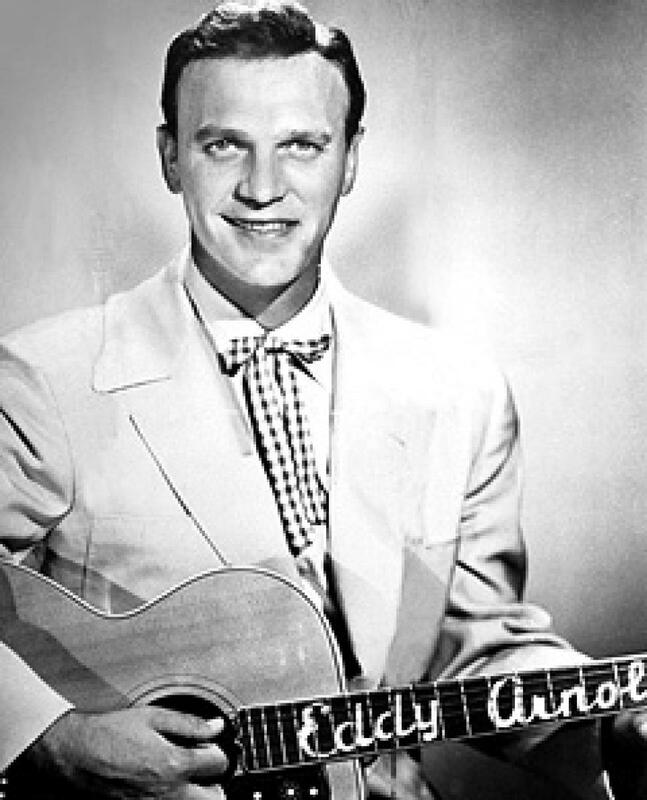 In the 1950's Arnold moved to television hosting The Eddy Arnold Show. He would also host and featured on a variety of other shows into the early 1960's. In the 1950's as Rock and Roll started gaining popularity, Arnold's popularity started to wane. In the early 1960's Arnold reinvented himself and started a second career which brought music to a whole new audience. In 1965 he had his first hit in more than decade. It was followed up by one of his better known songs Make the World Go Away. Arnold would continue recording new albums through the late 60's and 70's. In the 1980's, Arnold announced that he was semi-retiring from music. In 1984, the Academy of Country Music awarded Arnold the Pioneer Award. This would begin a string of awards for the singers life's work. This included the song Make the World Go Away be inducted into the Grammy Hall of Fame by the National Academy of Recording Arts and Sciences and being awarded the National Medal of Arts in 2000. In 2005 he received a lifetime achievement award from the Recording Academy. Arnold passed away from natural causes on May 8th, 2008. Arnold was a member of East Nashville Lodge No. 560 in East Nashville, Tennessee. A Poem for Mother's Day!